If you are given the task of coming up with a headstone inscription when a loved one dies, you may want to consider a funny headstone saying. Humorous or comical epitaphs are used for those whose lives were full of fun, joy and a little practical joke now and then. What better way to send off the comedian in your life than with a headstone that incites a little chuckle by all who read it. Take that blank headstone and add a funny saying, image or anecdote. Remember, whatever you choose will be there forever, so select your words wisely. This type of epitaph is appropriate for someone who really joked about his or her illness and/or impending death. This type of quote can be upsetting for some, so make sure all immediate family members are on board. This lighthearted epitaph is for a father whose children knew how hard he worked when he was alive. They are comforted in knowing that he is resting -- and not toiling -- in Heaven. If you are paying tribute to a loved one who was passionate about the sport of fishing, then this type of headstone is right up his alley. Another lighthearted headstone, this religious epitaph reassures loved ones that the deceased person really made it to Heaven. No misunderstandings about that! This cute gesture with the words "meet me here" can be added to any person's headstone without seeming too inappropriate or out of place. This headstone for an individual's pet is testament to the love someone had for their buddy. Of course, he wasn't any trouble! While a funny headstone saying may be comical to plan, make sure it is properly executed. This is especially helpful if the deceased person picked out a headstone before his or her death. 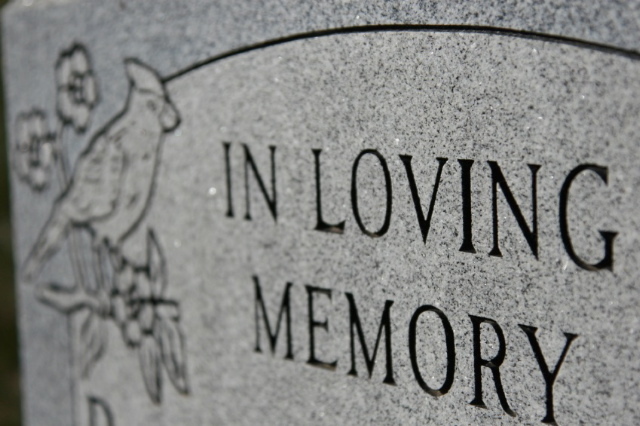 Check out this gallery for more information on how to design a headstone.